The International Code Council (ICC) joins organizations worldwide in recognizing World Water Day by promoting initiatives that improve access to clean and plentiful water for all. This year’s theme is “Leaving no one behind,” a goal that the Code Council advances through its commitment to developing modern codes and standards that make water systems more efficient and sustainable and help ensure that clean, safe water is available in all homes and buildings. The Code Council will be holding a roundtable – Mitigating Water Leaks in Premise Plumbing Systems – at this year’s Committee Action Hearings on April 27. The Code Council, alongside plumbing and other building safety professionals, will focus on identifying solutions to preventing water leaks in premise plumbing systems, an urgent issue as over 80 percent of the wastewater generated by society flows back into the environment without being treated. The Code Council is hosting Global Connections Day on October 23, 2019, in Las Vegas in conjunction with its annual conference. The theme is Water: Safety, Efficiency and Conservation. Presentations will include discussions of innovative yet practical approaches to water safety, various methods and policies to address water conservation drawn from multiple countries, and new technologies and programs to achieve water efficiency. 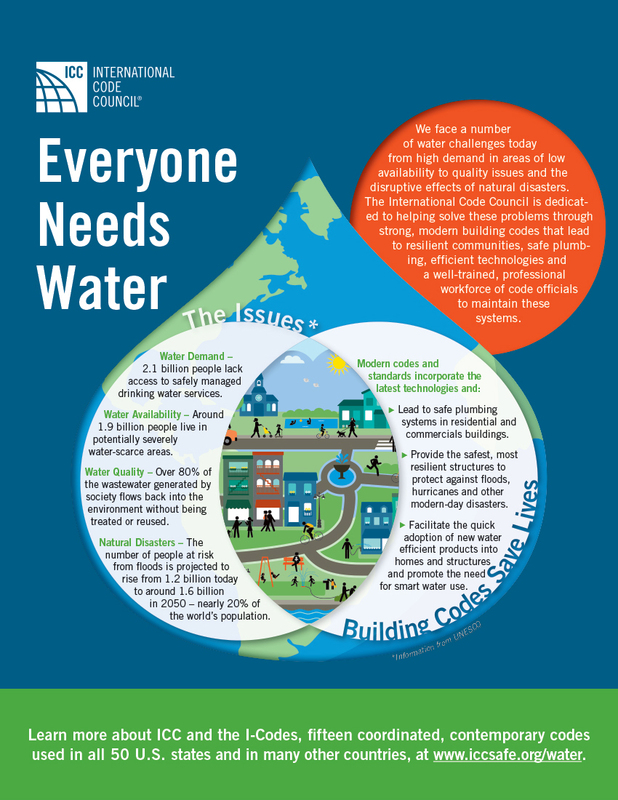 In recognition and furtherance of World Water Day 2019, the Code Council is calling on the U.S. Congress to require WaterSense performance measures in infrastructure investment. WaterSense is a voluntary public-private partnership through the U.S. Environmental Protection Agency that promotes fixtures and appliances that boost water efficiency by at least 20 percent. Through 2017, WaterSense has helped Americans save a cumulative 2.7 trillion gallons of water and more than $63.8 billion in water and energy bills. ICC Evaluation Service, a member of the ICC Family of Companies, certifies product compliance to WaterSense performance criteria at no cost, in recognition of the importance of conserving water. Individuals can download the Code Council's water infographic, “Everyone Needs Water,” as a PDF or JPEG, and visit www.iccsafe.org/water for more information.